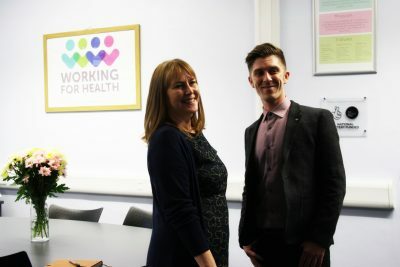 In 2015, Diane and Ricky took a leap of faith and left their jobs to set up Working for Health CIC. The entire purpose of the organisation was to bridge the gap between mental health services and employment services and provide a dedicated intervention to meet a person’s job search and employment needs while at the same time supporting their mental wellbeing. We know that people with mental health conditions WANT to work. We also know that people with mental health conditions CAN work. And yet, we know that people with mental health conditions are the least likely group to be in work. Mainly, it is because people keep falling through the cracks in the services. Employment services don’t have the time or experience to provide the specialist support to people with mental health conditions, and the mental health services see the therapeutic and social value of work but don’t have the skills, time or focus to help someone find work. Ricky and Diane are the co-founders of Working for Health. They had been working in the mental health and vocational rehabilitation field for decades: in the voluntary sector, the NHS, employment services and in central government. And after all this time the situation wasn’t changing for the people they were working with: people with mental health conditions were still not getting the specialist support to help them reach their potential. They knew that more could be and should be done. We believe that hope is the key. Working for Health offers that hope.